Belfast City Hall is the home of Belfast City Council. 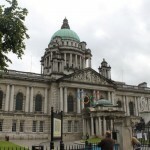 It is located in the centre of Belfast, near shopping streets, walking area and the railway station. The site was earlier occupied by the the building “The White Linen Hall.” In the end of the 19th century changes took place, and the drawings for a permanent city hall was made. This came as a result of the fact that Belfast was given city status by Queen Victoria in 1888. The construction started in 1898 and was completed in 1906. As a tourist you can enter into the City Hall from Monday to Saturday. There are tours every day, so just drop by for more information. You can also sit down in the grass next to it and enjoy the sun and your lunch pack. If you read about the City Hall on the Internet you will very often find pictures of the City Hall with a large Ferris Wheel next to it. It sure looks good, but the Ferris wheel is long gone, so you can skip looking for it. It was only there for a special time, and now it has been removed to Liverpool, if the rumours are true. Saturday – 2pm and 3pm.